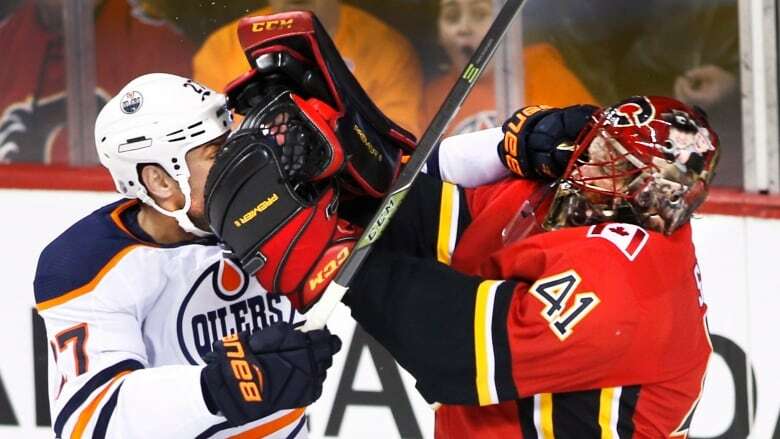 Dougie Hamilton's 17th goal of the season, the most by an NHL defenceman, led the Calgary Flames to a 3-2 win over the Edmonton Oilers on Saturday night. Dougie Hamilton continues to impress despite what's become a disappointing season for the Calgary Flames. Hamilton's league-leading 17th goal by a defenceman helped Calgary snap a seven-game losing streak with a 3-2 win over the Edmonton Oilers on Saturday night. "Quick release. [His shot] comes on you in a hurry," says Flames goaltender Mike Smith, who only has to stare it down in practice. "He changes the angle really well. He's definitely got a good shot." The goal that ignited the rally was Hamilton's wicked 30-foot wrist shot that beat Cam Talbot at 6:43. It was the first shot he faced. Hamilton entered the game tied with Florida's Aaron Ekblad and Columbus's Seth Jones. Since Jan. 1, Hamilton's 13 goals ties him with Sean Monahan for second on the team, one behind Matthew Tkachuk. The 24-year-old has increased his goal total in each of the six seasons he's played in the NHL. "It's so heavy and his release is quick, he doesn't need a wind-up to get the velocity on it. I thought Dougie had an excellent game," said Flames coach Glen Gulutzan. Garnet Hathaway put the Flames in front at 11:54, beating Talbot on a wrister inside the post from nearly 60 feet out. The short-handed goal was Hathaway's first goal in 42 games. "It wasn't his best night," said Oilers coach Todd McLellan. "If we could get one of them back, we'd take it. But he's been tremendous. In the last six weeks, he's been a rock for our team." The Oilers were the much better team in the second period, outshooting Calgary 12-5 and narrowing the deficit to 3-2 on Cammalleri's deflection at 12:41. "A tale of two teams. First period, not good, nothing to be proud of," said Cammalleri, who hadn't scored since Dec. 28. "Second two [periods], probably more how we want to play." "The second and third period, I think we played the way that we wanted to play," said Oilers winger Milan Lucic. "One of those games, again, where one period cost us the game." "We decided to play harder and compete a little bit more after the first," said McLellan. "Can't complain about the effort or the opportunities we created. Numerous 2-on-1's and 3-on-2's where it's on our offensive players' sticks and they're not going in."